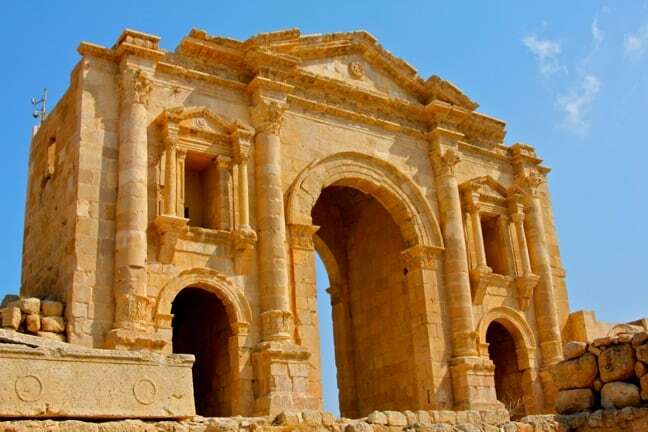 Originally known as Gerasa in antiquity, the ancient Greco-Roman ruins of Jerash, Jordan are located near the mountains about 30 miles north of Amman. They’re not nearly as popular with international travelers as world renowned tourist attractions such as the ancient city of Petra and the Dead Sea. But for those interested in history and archaeology (as we are), they are inarguably a must-see during your visit to Jordan. There are ancient Greek inscriptions establishing the city’s foundation by Alexander the Great, with human occupation of the region dating back over 6,500 years. But the city’s golden age came under Roman rule after it was conquered by General Pompey in 63 BC, and it eventually became one of the ten great Roman cities of the Decapolis League. This massive welcoming gate (which seems much larger in person) was built to honor the visit of Roman Emperor Hadrian to Jerash in 129/130 AD. It is not to be confused with the Arch of Hadrian (a.k.a. Hadrian’s Gate) in Athens, Greece. The Emperor is best-known for building Hadrian’s Wall, which marked the northern limit of Roman Britain and defended the territory from the ancient Britons (including the Picts) to the north. He also he famously rebuilt the Pantheon in Rome, and constructed the Temple of Venus and Roma, which is believed to have been the largest temple in Ancient Rome. The central section of Hadrian’s Arch allowed for huge chariots to pass through, while the sections on either side were meant for pedestrians (one for nobles, one for commoners). The recessed niches you can see at the top once held beautiful statues. Having visited the ancient ruins in Rome and Pompeii during my childhood made our day in Jerash seem all the more impressive. This entire immense city was hidden for centuries beneath the sand before archaeologists excavated and restored it over the last 70 years. 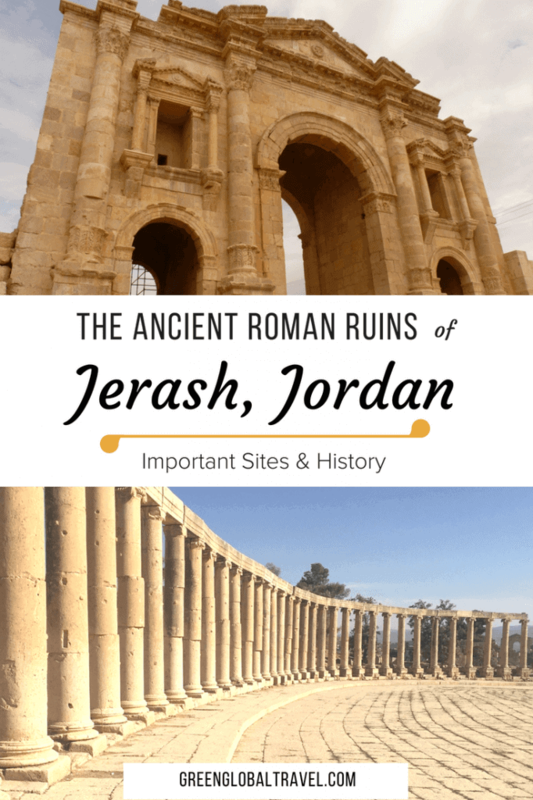 Our private guide, Ali Abudayeh, suggested that more than 50% of the city of Jerash is still waiting for funding to be excavated! It was amazing to walk through the oval Forum (with its 56 ionic columns) where massive public gatherings were once held, and the Hippodrome, where up to 15,000 people once assembled regularly to watch chariot races and fierce gladiatorial battles. You could almost feel the history in every step through the cobblestone paths of the ancient city. 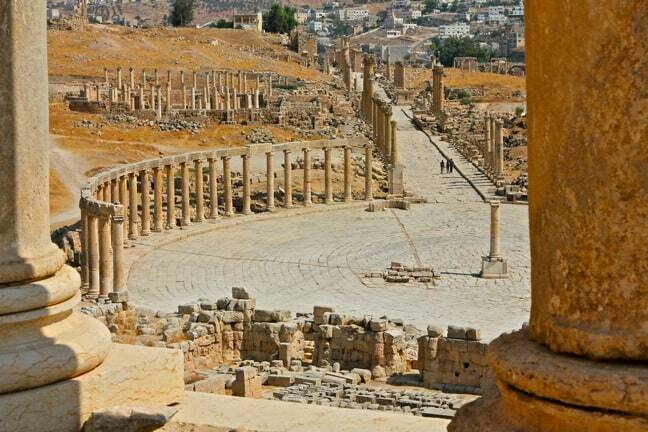 After Emperor Trajan built roads throughout the region in order to bring more trade to Jerash, the city achieved an impressive level of prosperity. The remains of its great temples (such as the Temple of Zeus, from where the shot above was taken) practically reek of wealth. The walled city ultimately expanded to a size of approximately 800,000 square meters (around 200 acres). This photo, which shows the modern city of Jerash in the background, only hints at the massive size and scope of the ruins. 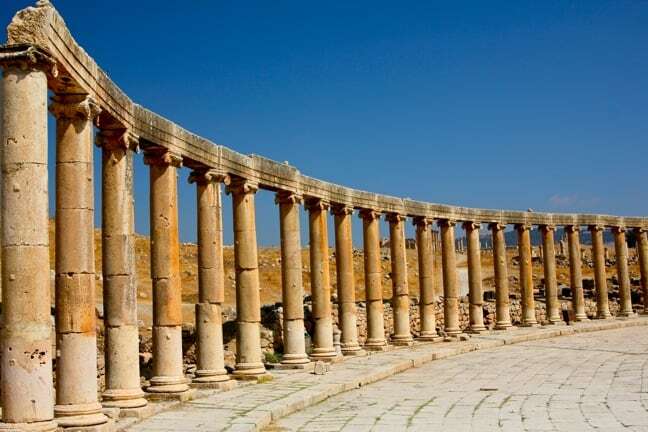 Jerash flourished for more than 500 years before the Persian invasion of 614 AD gradually led the city into a state of decline. 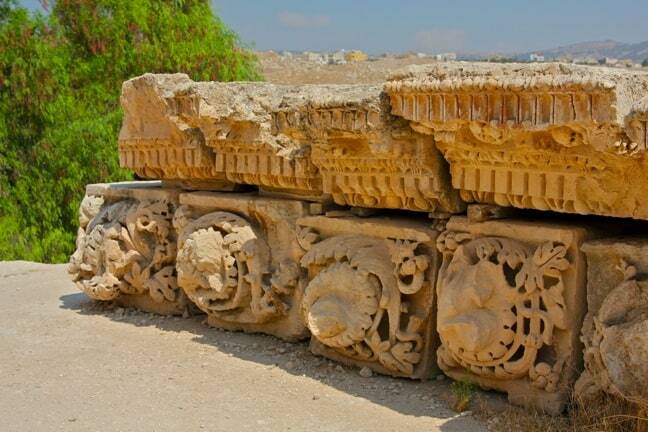 But it was ultimately a major earthquake (circa 749 AD) that caused the devastating destruction of the Jordanian city. Even today, nearly 1300 years later, the rubble created by that catastrophe lies everywhere you walk. 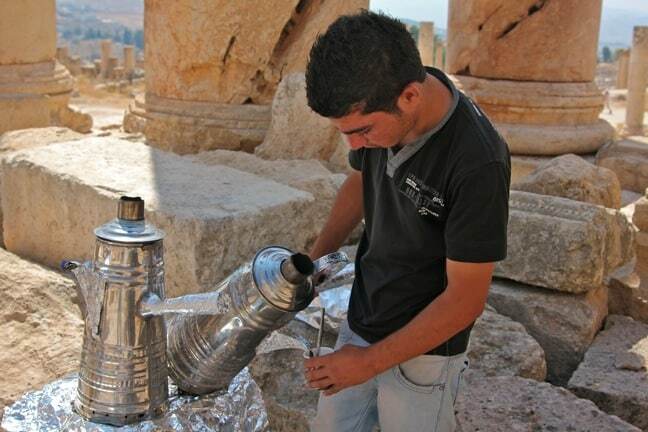 When we visited, workers remained busy gradually putting Jerash back together, stone by stone. But even the ancient ruins that hadn’t been re-assembled yet were still impressive, showcasing an astonishing sense of artistry and attention to detail. It was truly a remarkable feat of architecture and design, especially when you consider the fact that these buildings were created nearly 2000 years ago). 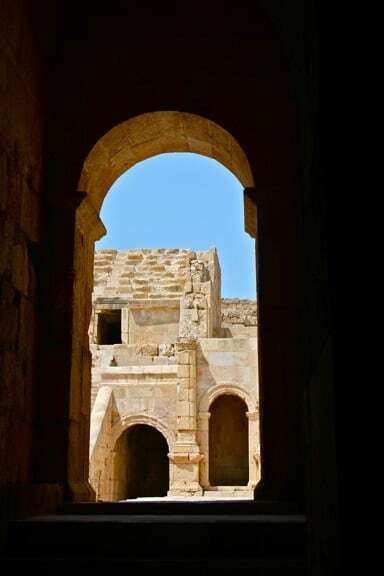 Located at the top of the hill above the Forum, Jerash’s South Theater was easily among the ancient city’s most impressive sites, reminding me of the Roman Coliseum I visited in my youth. Anywhere from 3000-5000 people would cram into the seating areas to watch performances of theatre and poetry, and you could feel still that energy emanating from the stones today. Ali demonstrated the innovative construction techniques that allowed sound to carry throughout the amphitheater. If you stood to either side of the spot where you see the woman in the beige shirt and white hat in the photo above, your voice sounded normal. But when you stood dead center, you could hear every word echoing and reverberating around you as if you’d been trained at Britain’s Royal Academy of Arts! For the #2 attraction in Jordan, Jerash was impressively free of crowds on the day that we visited. Though it got slightly busier as the day went on, there were only a handful of other visitors there when we arrived in the morning. Ali told us that the country’s tourism business has been hit extremely hard ever since the Arab Spring shook neighboring countries like Syria and Egypt. 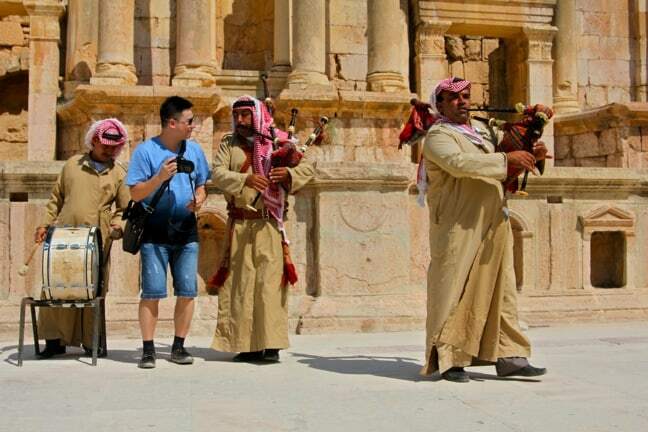 We’re still not sure about the connection between Jordan and the musical traditions of Scotland, but it was an entertaining diversion nonetheless. 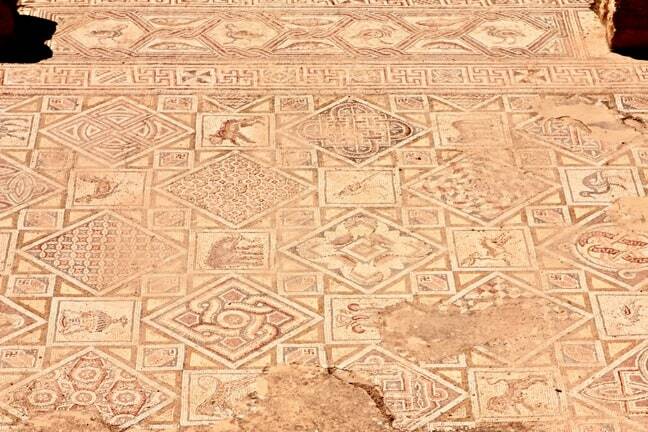 We were surprised to learn about the prominence of Byzantine influence in Jordan. But apparently there was a significant Orthodox Christian community in Jerash starting around 350 AD. Among the city’s more remarkable ruins are the remains of a 4th century cathedral, an ancient synagogue, and around a dozen churches. Some of these (such as the one above) had no roofs left, but the mosaic tile floors were clearly masterpieces of their day. Mary and I are both huge fans of mosaic art, and the Byzantine mosaics we saw throughout the country during our two weeks there were some of the most impressive we’ve ever seen. Though the colors of the tile had obviously been a bit washed-out over time and seemed faded in the scorching sun, this floor piece really blew us away. By the time we made our way to the ruins of the Artemis Temple, about 2/3 of the way to the North Gate of Jerash, severe fatigue had begun to set in. We were extremely jet-lagged after nearly 24 hours of travel the day before. Our brains were boiling from the intense heat of the desert. And, to make matters worse, we were both dehydrated (because we left our bottled water in the car… a mistake we wouldn’t make again!) and extremely hungry. Fortunately, Ali was about to introduce us to what became our favorite Jordanian tradition. I grew up in the state of Georgia, where tea is as much a part of our cultural heritage as red clay and magnolia trees. Often called “the table wine of the South,” we like our tea served as sweet as molasses. So when we ascended the steps of the temple and saw this young man serving up Bedouin Tea (black tea with either fresh mint or sage), I was elated. It was supremely sweet, minty, and as welcomingly refreshing as the shade in which he stood. The fact that he was also selling bottled water was a bonus. The communal enjoyment of tea became a Jordanian ritual we would observe several times a day as we explored the country’s ecotourism offerings. 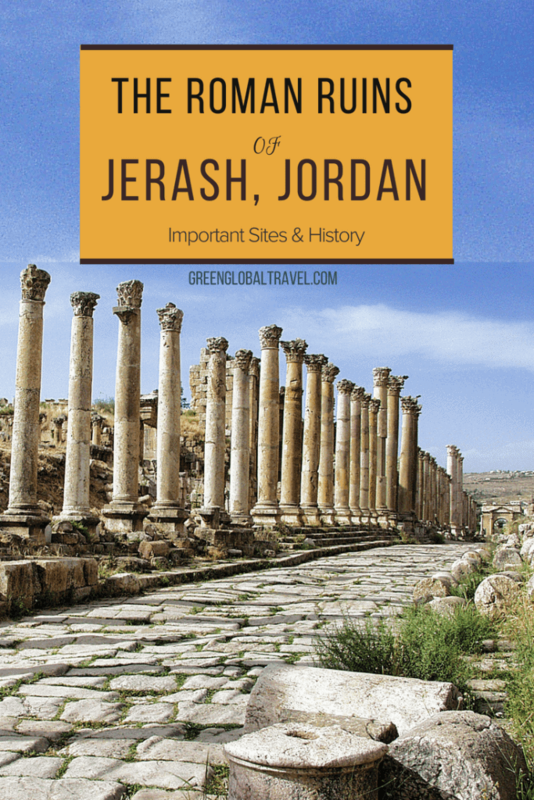 As we explored Jerash’s North Theater, it began to sink in for Mary and I that this little dream of ours that had evolved into Green Global Travel had somehow led us to the other side of the world, to explore amazing sights we’d only dreamed of. It was very surreal and powerful on an emotional level to finally find ourselves in the Middle East after watching movies like Indiana Jones and Casablanca as kids. 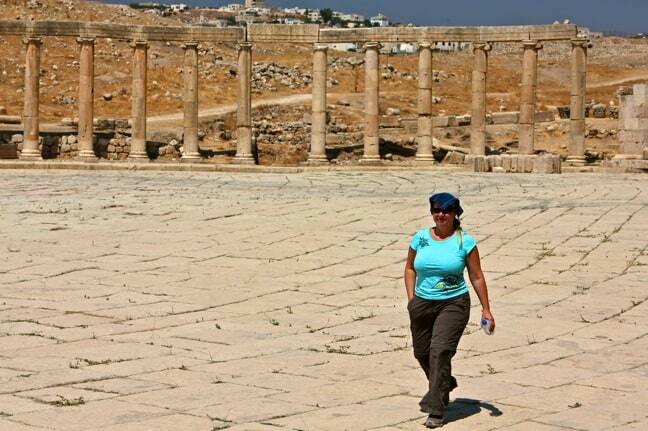 As we wandered the ancient ruins of Jerash, we took hundreds of pictures and videos and asked Ali tons of questions. But we also took some much-needed time to just sit in the shade of the theater quietly and soak it all in. As we made our way back towards the entrance, we walked down the long, colonnaded street known as the cardo. Its cobblestones were clearly etched with the tracks of chariots that must have ridden through by the hundreds. The heart of ancient cities, these roads would have been lined with shops and vendors and bustling with community activity. We stopped to take in the majesty of the Nymphaeum, which boasted elaborate lion-head fountains from which the city’s residents could draw their water. We could only imagine what a monolithic spectacle such buildings must have been to behold in the city of Jerash’s golden age. As we left Jerash, we saw a huge busload of tourists entering. Though we usually hate crowds, we were delighted to see them, because a remarkable archaeological site like this genuinely deserves to be seen. Despite being hot, tired and hungry, we were also extremely humbled by the majesty of these ancient ruins. We left sincerely hoping that Jordan could increase tourism revenues to finance further excavation. 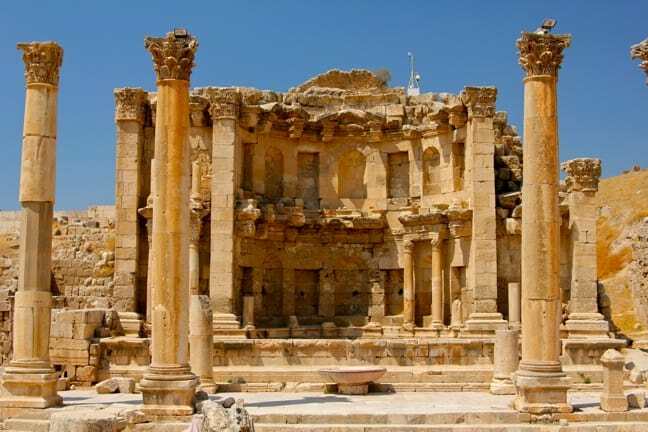 Jerash is located in northern Jordan and is 48 km (30 miles) north of capital city Amman. Insider Tips: Be prepared for the heat and lots of walking on uneven ground. Bring water, a hat (see last photo of Mary with a towel on her head), sunscreen and wear good walking shoes. Also, bring some small bills to pay for Bedouin Tea. It helps the locals and it completes the experience! 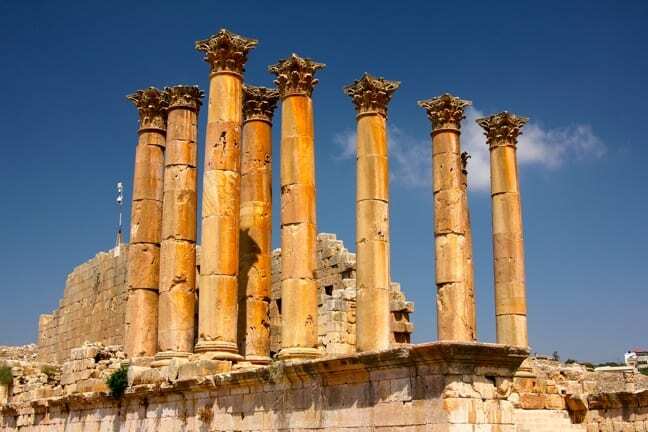 Cost of Tours/Entry Fees: A day-long tour of Jerash, Ajlun Castle and Umm Qais Museum costs $64.50, giving you a view of the marvelous architecture. Another similar tour is an all-day private tour of the same locations for $47.00, not including admission fees. Read Reviews for day-long tour or Read Reviews for Private Tour. 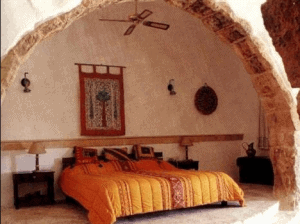 Dibeen Eco Farm House is rural place surrounded by olive trees with organic food, fresh air, hiking and farm animals. The rooms are spacious with a terrace. You may want to prepare yourself with mosquito netting for spring and summer (as not provided in the room) and with some food and beverages since there aren’t any grocery stores around. If you love nature and want totally serenity away from noise and pollution, then this is your place. Dibeen forest is 5 minutes away while Jerash Roman city is 20 minutes away from the property by car. Compare Rates or Read Reviews. 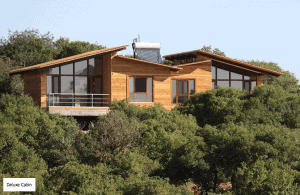 Ajloun Forest Reserve Cabins – Constructed in 2012 and set in the heart of a pristine nature reserve, these deluxe cabins boast terraces that offer stunning views of the north Jordanian mountains. If you listen closely at night, you might hear cackling Hyenas echoing through the hills. 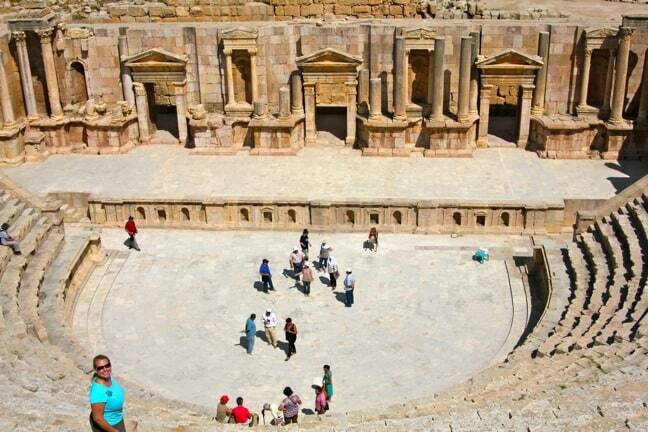 Jerash Roman city is 40 minutes away by car. Compare Rates or Read Reviews. 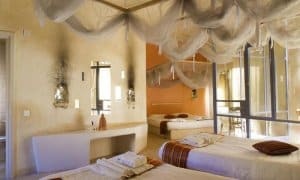 Azraq Lodge – If your Jordan travels take you to the Azraq Wetland Reserve, then you may want to check out this simple lodge (formerly a British military hospital). 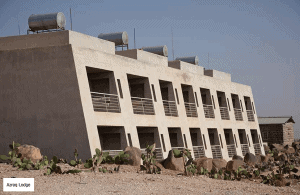 It has 1940s-style rooms with picturesque views of the Azraq Basin mud and sand flats. The kitchen gets rave reviews because it’s run by local women preparing traditional homemade recipes. Compare Rates or Read Reviews. Feynan Ecolodge – Located inside the Dana Biosphere Reserve, this award-winning eco lodge is frequently ranked among the best in the world for its numerous sustainability initiatives. The restaurant is exceptional, and sleeping on the roof was a once-in-a-lifetime experience. Read Reviews. 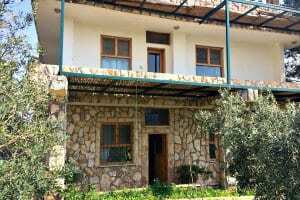 Hotel Taybet Zaman – Located near Petra, this charming hotel was once the bustling village of Taybeh. The mayor suggested turning it into a tourist hideaway, run in partnership with the local community. Its authentic Bedouin-style rooms combine traditional and modern, while the pool is sublime and the restaurant exquisite. Compare Rates or Read Reviews. Captain’s Desert Camp – If you’ve ever dreamed of camping in the Wadi Rum desert, Captain’s Camp is the perfect place to do it. 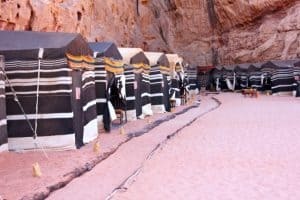 Traditional Bedouin tents, local musicians on drums and oud, delicious Middle Eastern food, rousing 4X4 sunset tours, morning camel treks, and sleeping under the stars. These are memories we’ll treasure forever! Compare Rates or Read Reviews. Kempinski Hotel Ishtar – We don’t often indulge in 5-star luxury resorts, but this one on the shores of the Dead Sea was the perfect place to wind down our exhilarating 10-day Jordan adventure. After floating in the salty sea, cool off in their gorgeous infinity pool or treat yourself to some pampering from their impressive day spa. Compare Rates or Read Reviews.